JuanaMikels.com: I'm Contributing to 31 Days to a Better Marriage Series that Starts Today! I'm Contributing to 31 Days to a Better Marriage Series that Starts Today! Hi everyone! Happy October! I love the first day of a new month because I love new beginnings! And with that, I'm so excited to announce today that I'm participating in a great marriage series that begins today with 30 committed Christian wives. It will run each day in October. It's all hosted by my blogging friend, Jolene Engle. Her blog is over at The Alabaster Jar Ministry. I'll see you over there on October 30 when I'll be guest posting on Day 30 of 31 Days to a Better Marriage! What did I write about? I'm glad you asked! I wrote about dying to yourself in marriage. Now that's only possible through Christ! I should know! Over 30 years ago, as a nonbeliever, I left my husband—after only two years of marriage. I became a Christian, we reconciled—and 7 years later, my hubby became a Christian. We will celebrate our 33rd wedding anniversary next April. To God be the glory! You can read my full bio here. I'm your neighbor at the Wifey Wednesday link-up. Dying to yourself is definitely something I need to work on. :) I"m interested to read the posts for this series! Well hi neighbor! I so appreciate your taking time to stop by, and then to take time to post a comment. 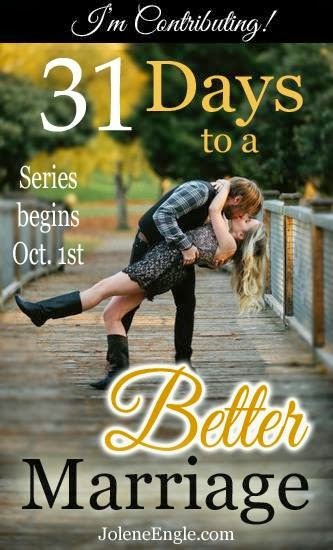 I think the 31 Days to a Better Marriage Series will be a huge blessing. Please visit again, Sister!